The Poitou-Charentes area is part of the region Nouvelle Aquitaine (Aquitaine-Limousin-Poitou-Charentes). For the purposes of this guide, we will be focusing on the area roughly covering the popular département of Charente (16). Note that some people when buying a property in, or doing some buying research on, the Poitou-Charentes region use the word ‘Charente’ when referring to a broader area than just the département of that name, perhaps because it’s the most popular and cheapest of the départements in which to buy. It might be that it’s just easier that way – hence our title and why we focus in particular on Charente for our buying advice. The Charente is one of four départements making up the Poitou-Charentes region, together with Charente-Maritime, Deux-Sèvres and Vienne. Situated in the south of the region, just one département away from the Atlantic coast, the climate is mild and temperate, with countryside that moves from vineyards and fields to rolling hills and forests, with hills and gorges in the east and south together with many rivers and lakes. 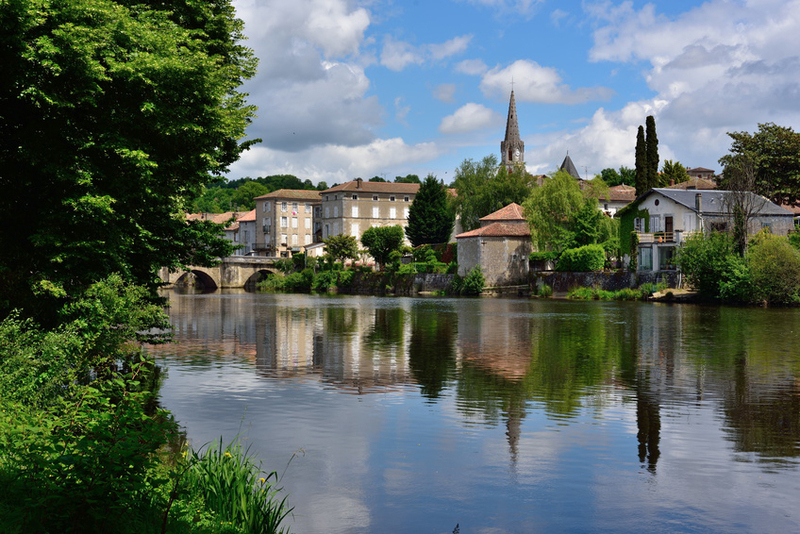 Within the département there are six Pays de Charente plus the capital Angoulême (65% of the region’s population live within its environs) and these separate ‘countries’ make sightseeing day trips easy to plan. The six areas all have distinctive features and each one has plenty to see and do through the year. 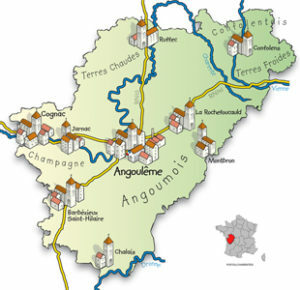 They are Angoulême and Entre Touvre et Charente, Ouest-Charente, Sud-Charente, Horte et Tardoire, Charente Limousine, Ruffécois. The Charente enjoys one of the most favourable climates in France, with fairly mild winters and warm summers that don’t feel too muggy. The broader Poitou-Charentes region is the second sunniest in the whole of France – buy a property here and you could find yourself eating outside well into October. Below are average temperatures for Cognac. There will be slight variations around the Charente region. The Charente is well served by international airports at La Rochelle and Poitiers, and further afield at Bordeaux and Limoges. For those travelling by train, Angoulême is well served with services from Paris. From Gare Montparnasse, allow two and a half hours. Make your booking with Voyages-SNCF. Driving from the Channel ferry ports take around 9-10 hours from Calais, while it’s quickest from St-Malo. Brittany Ferries runs services from Plymouth to Roscoff and Portsmouth to St-Malo, while Irish passengers can travel direct from Cork to Roscoff. They also runs services to three ports in adjacent Normandy: Cherbourg, Caen and Le Havre. Condor Ferries, meanwhile, operate services from Poole and Weymouth to St-Malo, and from Portsmouth to Cherbourg in Normandy. Despite being a very popular area, the Charente is still the cheapest department in the Poitou-Charentes region and it remains one of the most affordable part of France. However not only the landscapes vary from the north to the south of the department, property pricing are quite disparate too. The north of the department (north of Angoulême) including market towns such as Ruffec or Aigre for instance are amazing value for money when it comes to property pricing, while the south of the Charente including towns such as Aubeterre-sur-Dronne or Chalais offer the same popular rolling hills landscape found in the Dordogne for a fraction of the prices found further South. There is also some variation from the east to the west of the department following the usual “the closer to the coast the more expensive” rule. 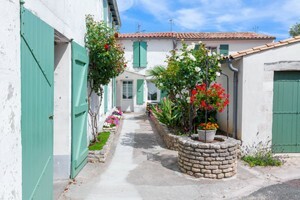 The wider region has much to offer: reasonably priced properties (perhaps you will fall in love with a typical Charentaise house with its creamy limestone frontage, pale green shutters and roman tiled roof), some beautiful Atlantic beaches (e.g. near Royan) and popular sea-side resorts (e.g. La Rochelle), picturesque countryside inland, some grand unspoiled cities (e.g. Poitiers, Angouleme) the amazing Marais Poitevin inland waterways and, last but not least, the highest sunshine hours after the Mediterranean. Typical of the whole region, the Charentaises are bastide-style properties architecturally very rectangular and symmetrical. They usually offer two storeys, a courtyard at the front, a garden at the back and one or several outbuildings. The price of these properties varies a lot depending on location, size and state of repair ranging from €100,000 to €400,000. 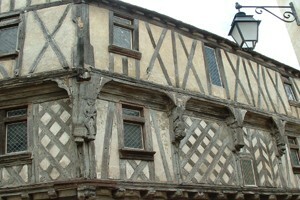 These can be found in wealthy market towns such as Cognac and are legacies of the Middle-Ages. Some of these properties have been turned into tourist attractions but some of them are still inhabited. However, they are rare and all listed, making it impossible to give an average price for these exceptional properties. 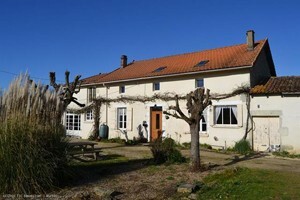 The Charente is a very popular holiday destination due to its sunny climate and therefore it is no surprise that many properties have been turned into gîte businesses. Starting from €200,000 onward (depending on size and facilities) these properties are very popular with foreign buyers with varied budgets looking either for a change of lifestyle or to complement their revenue or pension. If you’ve got your heart set on a French property in beautiful Charente, a phone call to the FrenchEntrée Property team is a good place to start. I am trying to escape the UK weather but want to be within a day’s drive of Calais. Would the Charente department answer these two criteria? The Poitou-Charentes in general enjoys a microclimate, with long, warm summers and mild winters and despite the Charente not being one of the coastal departments, it of course benefits from the Atlantic Ocean influence. Apart from two Mediterranean regions, the Poitou Charentes is the French region getting the most sunny days per year. I am looking at retiring in the Charente but I am wondering if this is not too far south for my family to visit regularly. What do you think? The Charente is about seven hours drive from Calais, obviously this is a long trip but doable in a day. 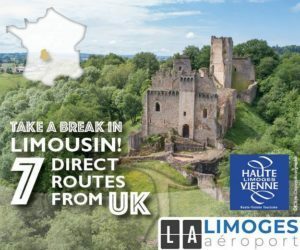 However, a real plus of this department is its access through different airports: La Rochelle, Limoges, Bordeaux and Poitiers airports have many connections to the UK (many with low cost airline company) and will enable access to the Charente in less than 1h30min. If you are a nervous flyer, TGV lines in the Charente enable to access Paris in less that 2 hours and 30 minutes. I have decided to move to the Charente but I only have a budget of €50,000. I can do decoration as I go along but I cannot take on a renovation and need the house to be habitable from the start. Am I unrealistic? You have a tight budget but you have chosen the right part of France to get value for money. I would advise you to focus your search around Ruffec, Champagne-Mouton or Confolens in the North of the Charente. Around these places, your budget will get you a little townhouse in need of TLC but where you can comfortably live while you upgrade it.